Within the pages of the Pathfinder Society Roleplaying Guild Guide you will find everything you need to bring your own character to life. Whether you are new to the Pathfinder Roleplaying Game, or a pen & paper roleplaying game veteran, the answers to your questions about the Roleplaying Guild are right here! I wanted to address some comments from prior reviews, but then I realized that most are for the older versions (1 through 5) of the document. So, yeah, I guess maybe the older versions were not printer friendly, but I just printed the new season 6 document on a black & white laser printer and it seems fine, and readable. The PDF displays on my tablet OK, too, though my tablet is new and fast. I guess older ones might struggle with it. Regarding the removal of tieflings as a playable race, I believe that's just fallout from season 5. That is, we just played through a huge story arc about a demon invasion, and I believe that all outsiders and otherworldly/extraplanar types are now on "the outs" with Pathfinder Society. That will change for story reasons I'm sure in another season or two, but for now at least it makes thematic sense. As for the quality of the modules for season 6, that probably needs to go into the reviews of each individual module, but I have to admit that I really like it so far. The fights in 6-01 were much harder than I expected, and a PC died. I thought that was cool for it to be so dangerous, though I understand some will hate that. In 6-02 I loved the social interactions with previously-unknown Technic League. And the big boss fight was very scary and had a secondary fight that really surprised us. I again found it fun, though I understand a table full of players who have zero adamantine weapons will find it too hard and probably all die. Also, regarding 6-02, we had a hugely fun time with our skills, but see the next paragraph for why it was fun for us and not for others. The only thing I don't like about season 6 is the introduction of a new feat, without which you cannot use your skills to interact with technology. It's basically a "feat tax" to be good at all the season 6 modules. Nobody in PFS near me is following that rule, even though it's mandatory and even though anyone not following it is in danger of being ousted. Doesn't seem to matter; everyone from top to bottom hates it, so it's completely gone. If any official employee from Paizo were to ask, we'd nod and say it's there. At the table? We don't even *ask* if a player has the feat. Does that upset management? Oh well, they introduced something bad, and the community rejected it while they weren't looking. So overall season 6 has been great and the season 6 guide seems fine. But we killed the bad stuff, and we like brutally hard fights, so your mileage may vary. The fact that it's not only not printer friendly, but looks like it's going to waste even more ink than the previous one is not good. Personally, while I do like some aspects of the theme, I'm not digging the art at all, especially in regards to how disappointing Season 6 play has been so far. Like the other Season 6 products so far, the layering and graphics look like they are messed up somehow, which makes the loading time on my tablet wonky and take too long for some reason. Granted, it's free, but still, I just don't think the quality is there. So far, the only real improvement I do like is the added line that states a group can decide to play up or down if they fall exactly in the middle of two sub-tiers. But other than that, not really impressed. You're allowing master summoner, wayang and Nagaji and you got rid of Aasimar and tiefling?!?! Come on! I was just looking at this and on page 28 the text in the left column seems to disappear into the picture, words are cut off and can't be read. What pdf reader and OS are you using? This sounds like the same issue a number of people have had recently due to differing software. I think there is a problem with that page, which we'll fix on Monday. Yeah, I just discovered that problem as well. Still, I'll be digesting the previous 27 previous pages of cool, interesting rules until Monday, at least - I'll be back Monday, then, to read over those last four paragraphs before the "Good Luck" section. We posted a revised PDF fixing these errors late yesterday. When should we expect an update to the Socitey rules?..Are we waiting for the PFRPG to be released? Nope, we're waiting for me to be caught up on the scenarios themselves. Expect version 1.2 after the new year. Is there an updated version available? I just downloaded it from the "My Downloads" section and saw that it is version 1.1 from August. Could you please include the version number in the product description? Josh may still have that funky illness, anything he was working on will probably be delayed. Nope, that's the newest one there is. I think the version 1.2 is quite high on Josh's list of priorities. Should be out soon(ish) I think. Including the version number in the product description is a good idea. I've added the version number and date. Here's a link to a recent post from Josh on the 1.2 timeline. Thanks for updating the information and the link. Everything is fine now :-). The hit points for bard, ranger, rogue, sorceror, and wizard do not agree with those in the main game guide file (Beta Playtest). In the OGL file the hit points are the lower ones used in the old 3.5 game, but the Pathfinder Beta makes a point of raising them for these weaker classes. Which are correct? Pathfinder Society games (at least until the PFRPG rules are out) use 3.5 rather than Beta. Thus, the Year 0 modules (which are all thats' been published so far) uses the old hit dice, along with other rules. No CMB/CMD, for example. Paul is correct. No PFS mods were released using PF Beta. They were all 3.5. Come August 13th, all of the upcoming modules will be in the PF Core Rules. Pathfinder Society is skipping the Beta completely. As a side note, Joshua Frost has said that GMs will be allowed to convert older 3.5 adventures to the new Core Rules and still legally run them. Pathfinder Society Organized Play Season 1 kicks off on August 13, 2009 at Gen Con. 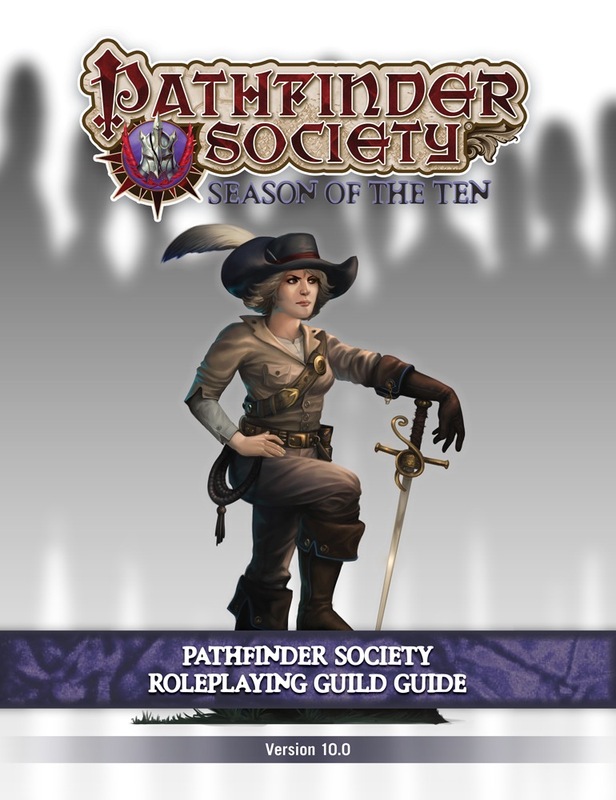 The Guide to Pathfinder Society Organized Play has been updated to version 2.0 and includes everything you need to know to your existing Pathfinder Society characters ready for the new season under the umbrella of the Pathfinder Roleplaying Game. Even if you've memorized v1.1 of the guide from cover to cover, please take some time to thoroughly review the new rules as many items have changed, been eliminated, or have been added new. Though we're releasing this early, these rules do not go into effect until August 13. Until then, please continue to use v1.1. I declare this Frost Day! A thread has been started here to track F.A.Q. regarding version 2.0. Thanks for the faq page. Thank you from myself and on behalf of my player group to (in no particular order) Joshua Frost, SKR, Erik Mona, Vic Wertz, Lisa Stevens, James Davis (and the artists Andrew Hou and Wayne Reynolds), Jeff Alvarez, Dave Erickson and Chris Self for the work, sweat, blood and tears that went into getting this out today! Am I crazy or is there no Faction field in the Character Sheet? Also, is it ok with Paizo if I make the character sheet into a calculated form and post it? Maybe he's already an "Ex-Monk" :) they keep thier class features but are barred from further advancing in the class. While we can certainly scan and/or fax the appropriate sheets for online play; I'd like to make a suggestion. Could the Pathfinder Society Character Sheets and Chronicle Sheets be available here as seperate downloads? It would make it easier for Gamemasters who are running a Pathfinder Society Organized Play session online. There does not seem to be enough space in the new guide to organized play concerning converting Year Zero characters. The boards do not seem to be an effective way to answers questions because of all the messages you have to sift through to find/or not find your answers. I politely request that the conversion process get its own PDF or FAQ that addresses just questions about conversion and Year Zero. For the moment, I do have some questions. Our group recently started playing Pathfinder Society and we have only gone through 5 adventures. We all want to convert to the Pathfinder rules ASAP but are dismayed that we will miss the chance to play the rest of the Year Zero adventures. 1) Can we still play Year Zero adventures, and if so, why would we want to (other than going through the cool stories) if we lose everything gained in those adventures? 2) Do you have any plans for converting the Year Zero adventures to the new Pathfinder rules and offering them again? 3) Can we convert our characters now and still play Year Zero adventures? 1. Yes, why do you think you will lose everything? You gan gain exp/money and maybe PA for playing season 0 scenerios. 2. GM needs to convert the adventures themselfs. 3. Yes, in fact all PFS characters need to be converted, 3.5 is no longer authorized. I was wrong with number 2.. Season 0 Scenarios do not have to be converted, they can be used as is except for maybe figuring out CMB and CMD if needed, according to Josh here. It seems I misinterpreted something josh said on a different subject and got it wrong! So I Apologize. If I should post errata in another area or to a specific e-mail, please let me know. 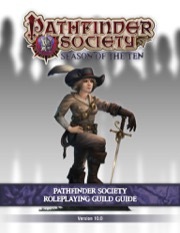 In the Guide to Pathfinder Society Organized Play PDF, there are two entries in Chapter 4 labeled "Step 6", and the Bookmarks are not structured correctly. The Pre-Generated Characters for Level 1 all seem to have one additional hit point than they should and are lacking two starting traits. Additionally Kyra's Channel Positive Energey should be x7/day. The Pre-Generated Characters for Level 1 all seem to have one additional hit point. Actually, I'm in error. They have the correct amount of hit points. I was forgetting to add in the optional hit point for favored class. Pregens don't get traits because they don't have factions. I'll update the steps and the bookmarks when I can get to 2.01. Thanks for pointing them out! We have updated the Guide to Pathfinder Society Organized Play PDF to version 2.01. We have removed duplicated text in the character creation chapter, and reorganized and corrected the PDF bookmarks. No rules have changed. Something's going on with 2.01. I tried reloading and re-personalizing many times...it never starts downloading. Is this also where the new version 2.1, to be released later today, will live? Can I just re-download it from "My Downloads" and get version 2.1? Yep—that's exactly how it will work. When it's ready, we'll send an e-mail to everyone who has downloaded it before letting them know they can get the new version. We have updated the Guide to Pathfinder Society Organized Play PDF to version 2.1. Added a new rule to the basic rules of Pathfinder Society called "Play! Play! Play!" For any additional questions or clarifications, please see the new Pathfinder Society Rules v2.1 FAQ thread on the Pathfinder Society messageboards. I have tried personalizing and downloading the updated Guide from the email and from your link here and all I ever get is version 2.01 from date 9/15/09. Thanks for getting this out Josh. Now I have something to read myself to sleep with tonight! Have you tried the "Personalize It Again" button? If so, are you sure that you're looking at the version you're downloading right now? Can you save the zip file somewhere else and extract it again? Sadly, yes. The first because someone declared in a thread that they could read the scenarios ahead of time because the rules didn't explicitly prohibit it and the second because there's a misconception that GMs have to follow the scenario exactly by the book and may not reward PCs for creative solutions. And, to be fair, the second also allowed me to codify and suggest how GMs might go about rewarding creative solutions in our OP environment and not feel unfairly constrained by the OP rules.